Let’s explain decision tree with examples. There are so many solved decision tree examples (real-life problems with solutions) that can be given to help you understand how decision tree diagram works. As graphical representations of complex or simple problems and questions, decision trees have an important role in business, in finance, in project management, and in any other areas. What is decision tree? Definition. (for business, financial, personal, and project management needs). Steps to creating a decision tree. A decision tree is a diagram representation of possible solutions to a decision. It shows different outcomes from a set of decisions. The diagram is a widely used decision-making tool for analysis and planning. The diagram starts with a box (or root), which branches off into several solutions. That’s way, it is called decision tree. In addition, decision trees help you manage the brainstorming process so you are able to consider the potential outcomes of a given choice. Let’s explain the decision tree structure with a simple example. No matter what type is the decision tree, it starts with a specific decision. This decision is depicted with a box – the root node. Root and leaf nodes hold questions or some criteria you have to answer. Commonly, nodes appear as a squares or circles. Squares depict decisions, while circles represent uncertain outcomes. As you see in the example above, branches are lines that connect nodes, indicating the flow from question to answer. Each node normally carries two or more nodes extending from it. If the leaf node results in the solution to the decision, the line is left empty. How long should the decision trees be? A decision tree should span as long as is needed to achieve a proper solution. Theoretically, when you are depicting a decision tree you should involve every possible decision and outcome in the tree. This will help you with analysis, planning, and will allow you avoid bad surprises. Now we are going to give more simple decision tree examples. Let’s say you are wondering whether to quit your job or not. You have to consider some important points and questions. Here is an example of a decision tree in this case. Now, let’s deep further and see decision tree examples in business and finance. 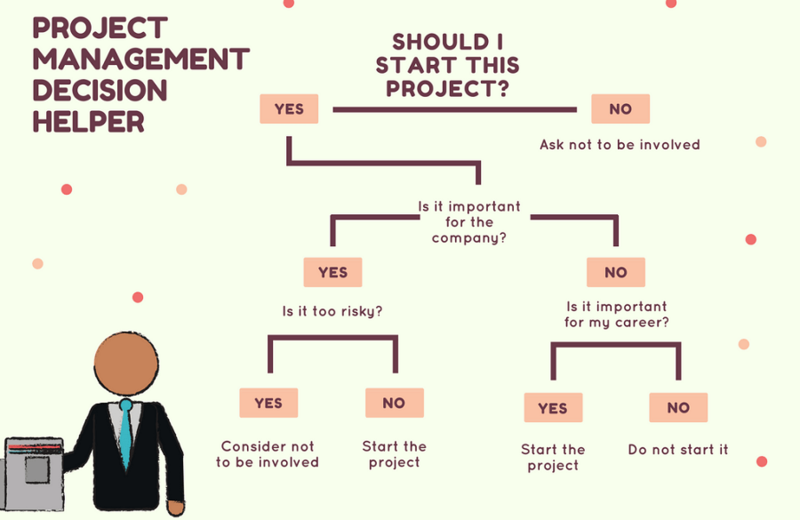 Imagine you are an IT project manager and you need to decide whether to start a particular project or not. You need to take into account important possible outcomes and consequences. The decision tree examples, in this case, might look like the diagram below. Download the following decision tree diagram in PDF. Don’t forget that in each decision tree, there is always a choice to do nothing! When it comes to the finance area, decision trees are a great tool to help you organize your thoughts and to consider different scenarios. Let’s say you are wondering whether it’s worth to invest in new or old expensive machines. This is a classical financial situation. See the decision tree diagram example below. The above decision tree example representing the financial consequences of investing in old or new machines. It is quite obvious that buying new machines will bring us much more profit than buying old ones. Need more decision tree diagram examples? As we have the basis, let’ sum the steps for creating decision tree diagrams. 1. Write the main decision. Begin the decision tree by drawing a box (the root node) on 1 edge of your paper. Write the main decision on the box. Draw line leading out from the box for each possible solution or action. Make at least 2, but better no more than 4 lines. Keep the lines as far apart as you can to enlarge the tree later. 3. Illustrate the outcomes of the solution at the end of each line. A tip: It is a good practice here to draw a circle if the outcome is uncertain and to draw a square if the outcome leads to another problem. 4. Continue adding boxes and lines. Continue until there are no more problems, and all lines have either uncertain outcome or blank ending. The boxes that represent uncertain outcomes remain as they are. A tip: A very good practice is to assign a score or a percentage chance of an outcome happening. For example, if you know for a certain situation there is 50% chance to happen, place that 50 % on the appropriate branch. When you finish your decision tree, you’re ready to start analyzing the decisions and problems you face. The above tools are popular online chart creators that allow you to build almost all types of graphs and diagrams from scratch. And finally, you can use a piece of paper and a pen or a writing board. Decision trees are powerful tools that can support decision making in different areas such as business, finance, risk management, project management, healthcare and etc. The trees are also widely used as root cause analysis tools and solutions. As any other thing in this world, the decision tree has some pros and cons you should know. It is very easy to understand and interpret. The data for decision trees require minimal preparation. They force you to find many possible outcomes of a decision. Can be easily used with many other decision tools. Helps you to make the best decisions and best guesses on the basis of the information you have. Helps you to see the difference between controlled and uncontrolled events. Helps you estimate the likely results of one decision against another. Sometimes decision trees can become too complex. The outcomes of decisions may be based mainly on your expectations. This can lead to unrealistic decision trees. The diagrams can narrow your focus to critical decisions and objectives. The above decision tree examples aim to make you understand better the whole idea behind. As you see, the decision tree is a kind of probability tree that helps you to make a personal or business decision. For a decision tree to be efficient, it should include all possible solutions and sequences. Decision trees are highly effective diagram structures that illustrate alternatives and investigate the possible outcomes. In addition, they show you a balanced picture of the risks and opportunities related to each possible decision. If you need more examples, our posts fishbone diagram examples and Venn diagram examples might be of help.